Plan your vacation at the Prince Resort and enjoy all the top-notch amenities that make the Prince one of the most popular resorts on the Grand Strand. Enjoy the Ocean Drive Difference by starting your vacation immediately upon arrival, as this property comes with fresh bed linens/bath towels, the beds are already made up for you, and the departure maid service are all included in your price. Modern furnishings, pleasing colors, spacious interiors, and spectacular ocean views greet you as you step into this luxurious two-bedroom condo. Everything you need for a relaxing and fun vacation is included to make your stay as convenient as possible. The large master bedroom has a king bed, ocean view, balcony access, and large private bath. The guest room has 2 full beds and is great for kids or couples. The fully equipped kitchen was upgraded in spring 2015 with new granite countertops and tile backsplash for a luxurious flair. 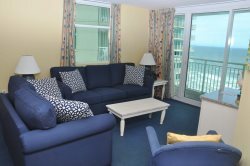 Prince 804 is perfect for weekly summer rentals, spring and fall mini vacations, and winter monthly rentals. Book your trip to the Prince Resort today! Extra bonuses include free parking, unlimited use of amenities and on-site restaurants, convenient location, and all the savings of our own Endless Fun Club!